An unexpected move by the U.S. Army Corps of Engineers to delay a critical Everglades restoration project prompted a Sierra Club-organized protest Wednesday outside a Restoration Task Force meeting in Royal Palm Beach. 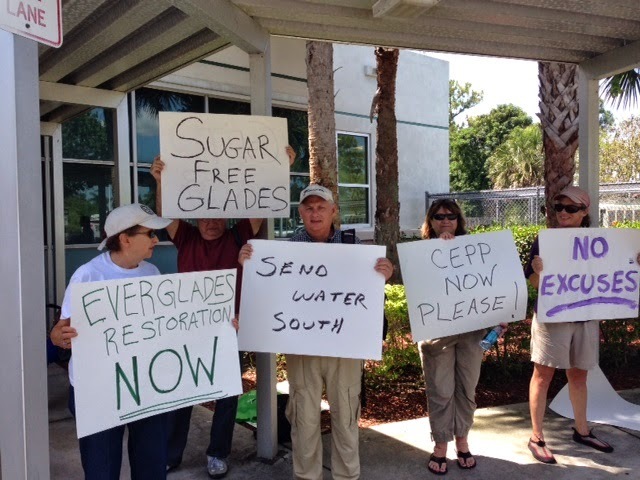 Sixteen activists protested with signs such as “CEPP IT UP” and chanted “No delay, Save our Glades,”, as the highest ranking Corps official, Assistant Secretary for the Army (Civil Works) Jo-Ellen Darcy, presided over the meeting. Two weeks ago, the Corps inexplicably delayed approving the Central Everglades Planning Project (CEPP), the plan designed to restore water flow through the heart of the Everglades. Amid widespread condemnation by environmental organizations, elected officials and newspaper columnists, the Corps has agreed to take up the plan again at a May 23 meeting.